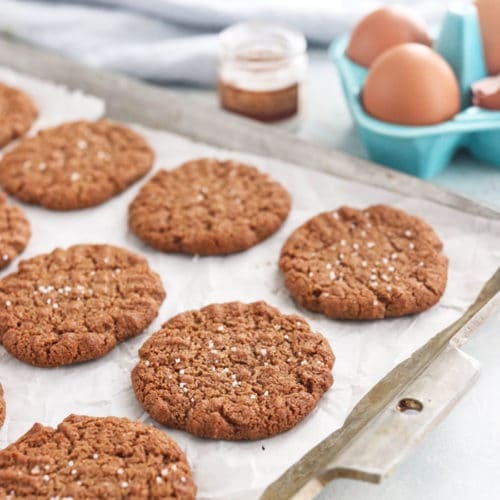 These ALMOND BUTTER COOKIES are easy to make, with just 5 ingredients! I love that they are made without flour, oil, or refined sugar. In a large bowl, combine the almond butter, coconut sugar, egg, baking soda, and salt. Stir well to create a thick, uniform batter. Use a tablespoon to drop the dough onto the lined baking sheet, keeping the cookies about 2 inches apart. Use a fork to flatten each mound of dough, and sprinkle the tops with coarse sea salt, if desired. Bake the cookies until lightly golden, about 12 to 13 minutes. For a crispier cookie, you can bake them for 15-20 minutes, just watch to make sure that they don't get too dark or burn.